Ozoni お雑煮 is a special miso-based soup enjoyed in the morning on New Year’s Day in Japan. 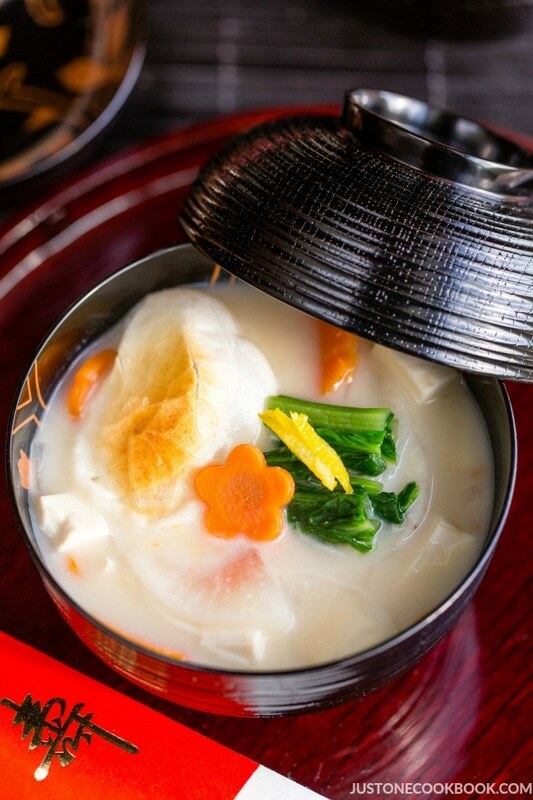 The soup usually includes mochi (rice cake), and the preparation varies by region and household. 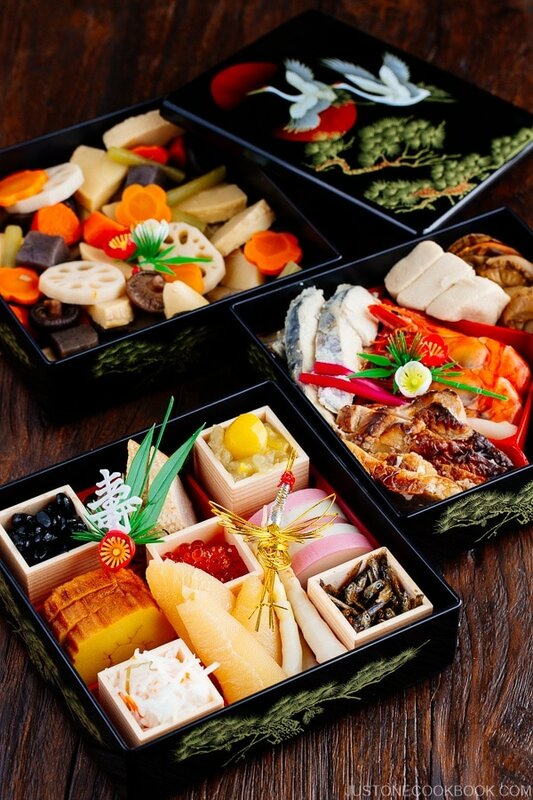 The Japanese celebrate the New Year by feasting on Osechi Ryori (お節料理), traditional Japanese New Year food packed in lacquered boxes along with this special mochi soup called Ozoni (お雑煮). 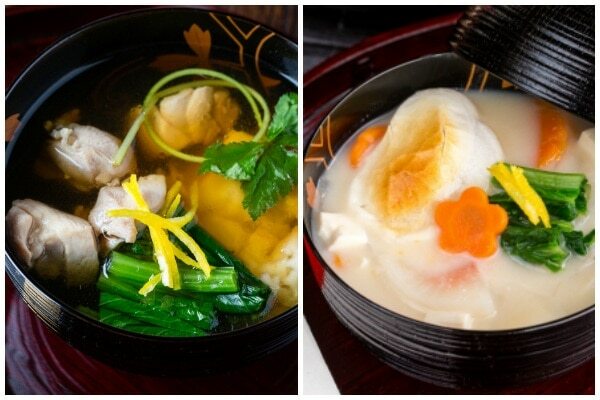 Ozoni is a special soup that we eat in the morning on New Year’s Day in Japan. It usually includes mochi (rice cake) and the preparation varies both by household and region. This delicious miso-based soup is enjoyed on New Years Day in Japan. Its flavor and ingredients varies by region and household. There are numerous regional variations in Japan but we usually divide into two types – Kanto (Tokyo area) style and Kansai (Kyoto/Osaka area) style. In the Kanto region, Chugoku region, and Kyushu region, ozoni consists of a clear miso soup which is flavored with bonito based dashi and soy sauce. In the Kansai region and Shikoku region, white miso is added to the kombu base dashi soup. 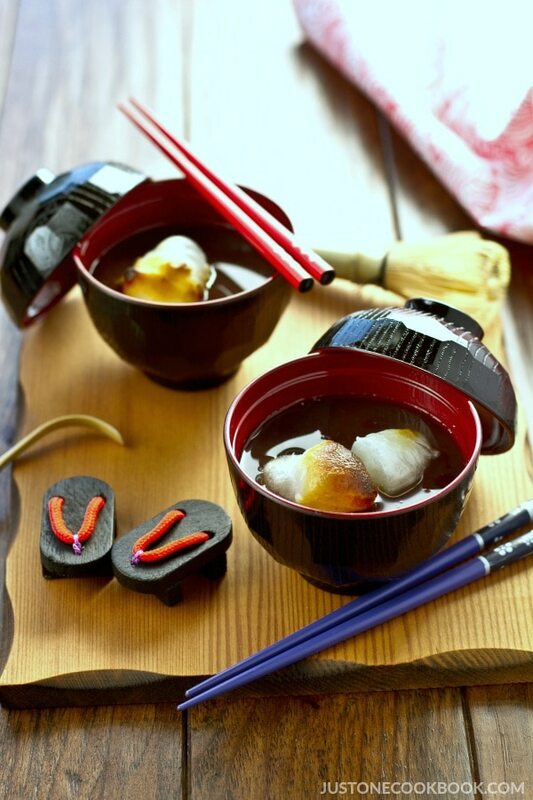 In some area in Tottori prefecture, their version consist of azuki red bean soup with round mochi. 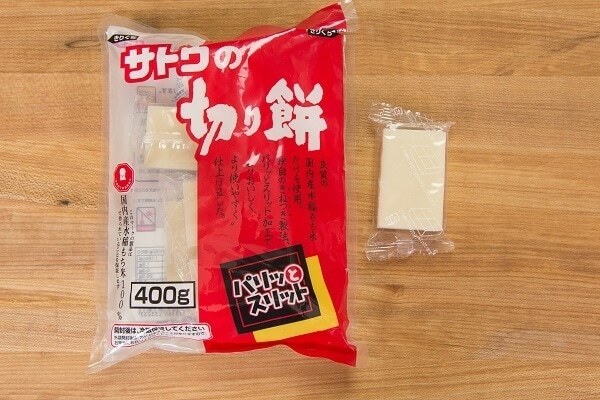 In the Kanto region, the square mochi is grilled/toasted before being added to the soup. In the Kansai region, a round mochi is cooked in boiling water before being added to the soup. Over 400 years ago, round mochi was commonly used throughout Japan. However, as more people started to live in the Tokyo area, it was too much of work making the mochi into the round shape by hands. Therefore big mochi cake was cut into small squares and they became the common shape in Kanto region. 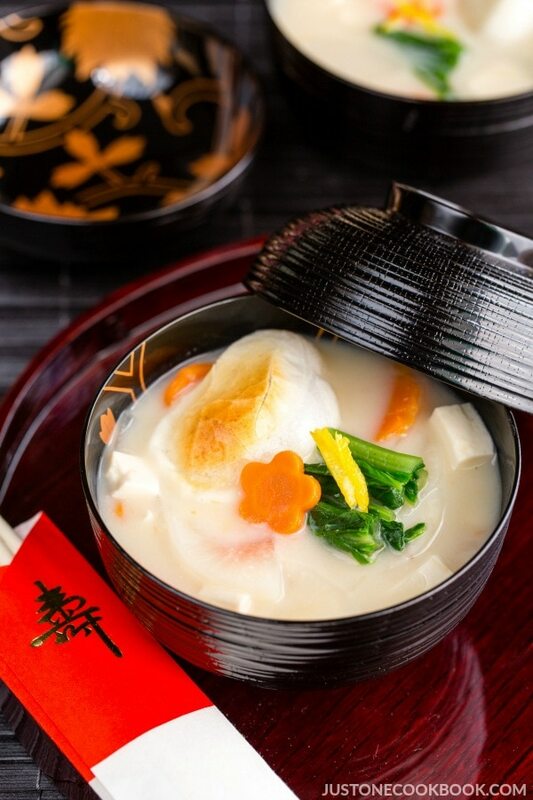 For the Kanto style, chicken, fish cakes, dried shiitake, carrot, and some leafy vegetables like komatsuna, spinach, or mitsuba are often included in the soup, and garnished with yuzu peel. 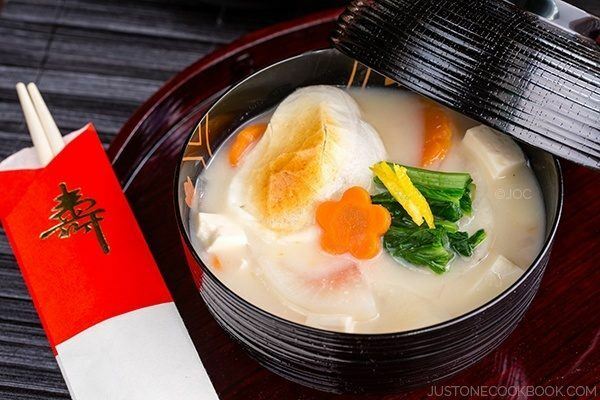 For the Kansai style ozoni, satoimo (taro root), daikon, and carrot are the common ingredients and often garnished with katsuobushi (bonito flakes) on top. Some regions close to ocean include fish and seafood, while mountain regions use vegetables and mushrooms. The additions to the soup vary based on the regional and seasonal ingredients. As I mentioned earlier, this new year soup not only varies by the regions but also by each household. My mother lived in Osaka before she moved to Tokyo for college. Her mother’s family was originally from Kyoto and her dad’s family was from Nara. Therefore, my mom’s family grew up eating Kansai-style. On the other hand, my dad grew up in Tokyo eating Kanto-style till he met my mom. So, my mom’s ozoni is a mix of both, with the Kansai-style base. 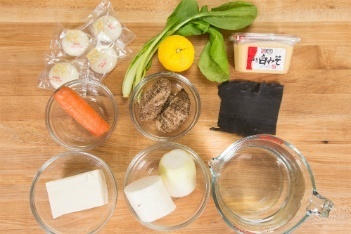 It includes 5 ingredients: satoimo (taro root), daikon, carrot, toasted round mochi, and tofu. She uses Saikyo Miso (white miso from Kyoto). For my version, I add leafy green vegetables (komatsuna or spinach) and yuzu peel, both of which are common ingredient for Kanto-style ozoni. The green color to the soup makes it prettier and I also like to add the fragrance of yuzu peel if I was lucky enough to get fresh yuzu. Today I’ll share how I prepare this new year soup. My children didn’t like ozoni when they were little, but now they love kansai-style and I’m so excited that we can enjoy this traditional food as a family. If you are new to Saikyo Miso (西京味噌), it’s different from regular white miso and it’s naturally sweet. The sweet flavor is similar to amazake (甘酒). This sweetness comes from the sugar produced through the fermentation process. Saikyo miso is made in Kyoto and it’s usually more expensive than regular miso. You might have tasted this special miso if you had fish called Gindara Saikyo Yaki (or the famous Miso Cod). You can find Saikyo Miso in a Japanese supermarket. 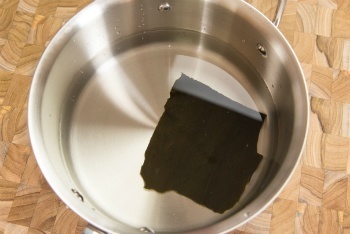 Soak kombu in water overnight in a large pot. Peel satoimo (taro) and slice into rounds. Soak in water to remove the slimy texture. Peel daikon and slice into rounds. If it’s a large daikon, cut into quarters lengthwise. Peel carrot and slice into rounds. If you like to decorate the soup with a carrot flower, cut out some of the round slices into floral shape. If you do so, separate the rounds and flower shapes pieces. You will be cooking round carrot slices with satoimo (taro) and daikon, but these flower slices will be cooked separately. Add satoimo (taro), daikon, and carrots into the pot filled with kombu water. Start cooking over medium high heat. Right before full boiling, remove the kombu and discard. Skim off foam (from satoimo/taro) from the surface of the soup with a fine mesh strainer. Lower the heat to medium low and cover with a lid, leaving a gap. Simmer until the vegetables are tender. Add water if too much liquid has evaporated. Meanwhile, cut komatsuna (or spinach) in half. Start boiling water in a saucepan. If you prepare carrot flower slices, add them into the water. When water is boiling, add komatsuna and cook till tender. Take out komatsuna and carrot when they are tender and cut komatsuna into smaller pieces. Set these toppings aside for now. Once the vegetables in the soup are tender, add miso. Add 3 Tbsp. first, then add 1 Tbsp. at a time till you’re satisfied with the flavor. My family likes thick soup so I tend to add more. Add tofu after you mix in miso. Peel the skin of yuzu and flip over to remove any white part. Julienne the yuzu skin. 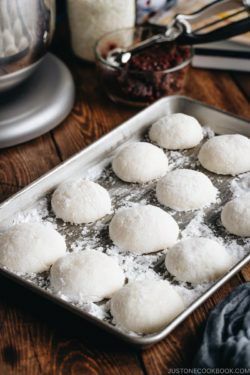 Use a toaster oven to toast the mochi until puffy. You can also toast mochi over open flame or under a broiler. Add the soup into a serving bowl first, then place add mochi on top along with the colorful toppings. Disclosure: Teak cutting board and Miyabi knife shown in this post/video were provided courtesy of CuttingBoard.com. I really love them both. The teak cutting board requires less maintenance compared to other woods and feels gentle on the knife when I chop. I highly recommend these additions to your kitchen if you are looking for a nice cutting board for everyday use! This soup sounds very special indeed. I remember loving mochi as a child. I’ve never tried making a miso based ozoni before–but I may try it this year since we all love miso soup.It looks so good and hearty with all the other vegetables. We usually just have a bit of mizuna and I don’t broil the mochi. Happy New Year to you and your family, Nami! Looks like 2015 will be bigger and better for JOC! So exciting! I always wanted to learn how to make this soup. You make it look so easy. It is so hearty and filling from the looks of it. I’ve always known New Year’s is a big celebration in Japan and glad to hear you’ll be with your family. I wish you many more good things for 2015, Nami. Thank you for your continued support and kind friendship all this time. Happy Holidays! 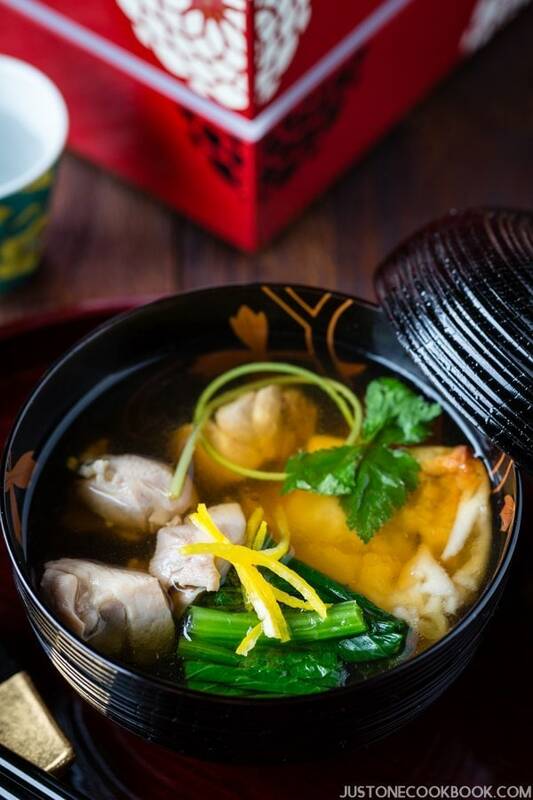 I love Japan culture so I have read about ozoni before, yours look so comforting and delicious! Wish I can have a bowl of this. (: Have a happy new year! that soup looks creamy and hearty and yet smooth and silky. I love that flavors going on and it seems so simple to make. I hope you are having a great Christmas with the family and here is to another wonderful year of good food and friendship. thankful for you! What a beautiful and nutritious soup to start the new year with. Happy New Year 2015 Nami to you and your family! Thank you Nami for sharing this wonderful recipe. I am half Japanese, and my Mother, who lives in Atami, used to make Ozoni with red beans. I followed your excellent directions and made your version of Ozoni for our New Years lunch today and my husband enjoyed it. I had to use the regular white miso, as that is all I had in the refrigerator, and used regular lemon peel. I live in the Bay Area and would like to know where I can purchase Saikyo miso. Is it for sale at Mitsuwa or in Japantown? Thank you for the recipes. 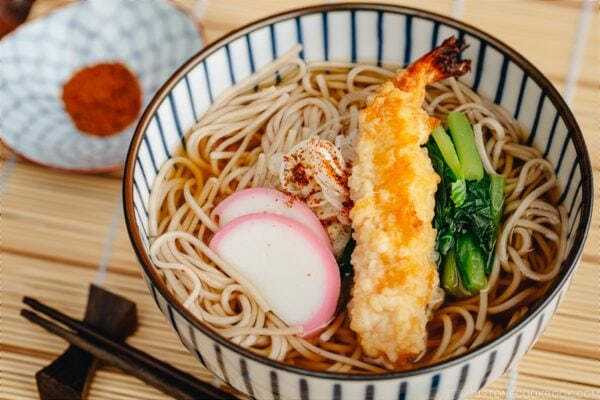 I love to cook, and when I made Japanese dishes I feel connected to my Japanese side. Ozone looks like a great fresh start to the new year. My daughter loves mochi, too. Happy New Year to you and your family, Nami. My daughter is going to Japan at the end of Feb. and will be living and teaching English in Osaka for a year. I’m so excited – I’m finally going to be able to visit. Want to go during Oban because she will have off for the holiday!!! I never knew mochi can be used in soups, got to try this recipe. 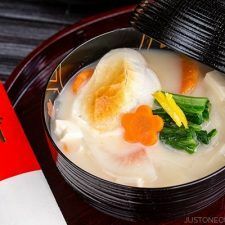 I’ve never tried making a miso based ozoni before–but I may try it this year since we all love miso soup.It looks so good and hearty with all the other vegetables. We usually just have a bit of mizuna and I don’t broil the mochi. What a beautiful dish and these pictures are amazing! INteresting soup, totally gotta try recipe!!! i only known about dessert mochi before…. I got married Christmas week, and we flew to Japan for our honeymoon. Starting in Osaka, I was served ozoni by the mother and grandmother of one of my husband’s friends. They shared the cultural tradition behind the soup. Moving on to Nara then Kyoto before ending up in Tokyo, I sampled and enjoyed ozoni in each region (as well as admiring the young women (and a few young men) visiting the shrines and temples in their amazing kimono. My Asian market had a handwritten flyer on the freezer door, advertising locally hand-crafted ozoni, 10 for $3.50. I got a package and am planning to make ozoni soup to celebrate our anniversary. Thank you for the summary of variations and styles. Wish I’d read it before going to the market — I saw Kyoto style white miso but didn’t buy it. It was definitely more expensive and I wasn’t sure how it was different. I wish a Japanese friend would take me through the market and explain things, but when I asked I got a very Japanese response “I only know a few things” and I wasn’t sure if she was being humble or declining. I decided not to push. The variety is daunting — especially because there are so few words in English/Romanji on the labels. Would be fun if my market were to offer classes on their products once per week. One week produce, one week fermented products, another week various types of fish products, condiments, etc. Would be really fun to do a soy sauce tasting! Hi Victoria! Happy Anniversary! What a wonderful story! Thank you so much for sharing. The Japanese grocery store “tour” sounds really fun, and I totally understand what you go through. I feel the same way when I visit Indian store or even in condiments section in Chinese grocery stores. Maybe I can do a supermarket tour video…. but I’m always passing through other customers and it’s probably annoying to talking to a camera. 😀 Japanese people know how to shop but we don’t necessarily know how to explain about foods or cooking. So your friend is afraid of not being able to help you properly… that is what I feel sometimes too, especially if my readers ask me and I’m a bit hesitant if I could be a good tour guide… I just go in and get out….and if I have to explain the different kinds of soy sauce… I would be so nervous! 😉 Thank you for writing, Victoria! I still remember very clearly my first New Year’s in Japan with my husband’s parents in Osaka. 42 years later I remember eating mostly shrimp and beans as those were the only foods I recognized. A few years later I made the decision to master Oseichi Ryori. The first year I was up all night and finished the last dish around 8:00 am. My MIL hadn’t taught me how to make their Ozoni so I used a recipe from Kyoto that I saw on TV. Not only does it use the sweet white miso, but calls for a dab of karashi (hot mustard). It is the one dish we feel we have to have every year. This year, because of severe carpel tunnel syndrome in both hands, we opted to buy most of our Oseichi ready made at the Japanese supermarket. I will make just a few dishes along with our Ozoni. Rynen-mo, yuroshiku oneishimasu and please keep sharing Japanese recipes. Hi Gayle! Yes, karashi is added to ozoni (with white miso) in Kyoto region! You have a wonderful memory of oshogatsu in Japan! And very impressive to make osechi staying up all night! At my grandparent’s, we used to spend 2 days for my family (about 10 of us). Akemashite omedeto gozaimasu! Honnen mo yoroshiku onegai itashimasu! I’m having a question about the mochi. Are these ones rather hard like you can get them in kagami mochi package? I’m asking because I got a kagami mochi as present and we were thinking to through them into the soup, but I found this recipe now, where you grill the Mochi. Thank you and please keep up with your work. Can’t wait trying your Bulgogi Onigirazu. Hi Pascal! Thank you for writing! Yes, the mochi I’m using is those hard rice cakes looks like this. I always grill mochi in my toaster oven. You can use a frying pan or oven, but toaster oven is the most convenient! I am looking forward to trying this once the weather turns cooler for fall, but in the meantime I was wondering if you had a source for acquiring the bowls with lid you use in this post. I purchased some wonderful donburi bowls with lids at daiso a few years ago and I love the size of the bowl, but for serving nabemono lid is so great for keeping the food hot as well. Unfortunately I have had terrible luck finding the bowl/lid set since then and mine a finally starting to wear out from frequent use. Hope this helps. I can look into it more if you prefer lacquer ones. Mmm I think this dish is perfect for New year! how can i make it for one person? Hi Nami! Does this mean to say “1 Kombu” in ingredients? Hi Lion! Yes! Thank you for noticing the error. We updated the recipe plugin and the amount got messed up pretty bad that time. 🙁 It’s been fixed. Thank you so much!